So this happened because whenever we go down to Maryland to visit my seester, I end up hanging out with my brother-in-law watching a lot of TV. One night he let me control the remote and we ended up watching like seven back-to-back episodes of Diners, Drive-Ins and Dives which, after Chopped, is like my favorite Food Network show ever. I love me some Guy Fieri, now there's a man who loves food. I totally want him to come hang out in my kitchen and just make those mouthgasm noises. My BIL did comment that a lot of the food didn't look that good, and furthermore, it didn't seem like food I would eat. Guy certainly makes it sound amazing, but who knows how it actually is in person. Anyway, one episode featured the restaurant Momocho in Cleveland, and the chef featured his specialty: coffee-rubbed brisket. It was slow cooked for hours, then shredded and served in a tortilla with onions and peppers. This definitely had possibilities. Tacos and burritos are a sure thing around here and this meat looked really spectacular. Furthermore it could be made in the slow cooker. I remembered an episode of Chopped where the secret ingredient was ostrich. One chef rolled it in cocoa powder before searing it. I thought about doing this with the brisket because when I make chili, I always throw in a square of baker's chocolate. Yet the coffee rub sounded interesting, too. Could I do both? I scouted around the Internet, compared and contrasted, and in the end, came up with this. And it was crazy. Mix all the dry ingredients in a large bowl. Cut the brisket into two pieces, rub all over with either olive oil or coconut oil and then roll it in the dry rub, really getting it coated. Your hands will be a mess. It's OK, just keep packing on the rub. Get the brisket into a ziplock bag and let it sit for either 2 hours or overnight. Pour the can of coconut milk into the slow cooker. Put the brisket in, cover and cook on low for 8-10 hours. Take the brisket out, skim the fat off the gravy. Shred the meat with two forks and put back into the cooker. Serve over coconut rice, or in a soft tortilla, with onions and peppers. As with so many things, I was late to the fish taco party. For a long time they just didn't sound appealing at all, or my inner 13-year-old would giggle. Then one night I was watching one of my favorite Food Network shows, Guy Fieri's Diners, Drive-ins and Dives, and one of the segments was this place in California where the specialty is fish tacos. I saw how they were prepared and thought I can do that. Oddly enough, the first time I made them at home was when I had no kitchen. We were renovating, the kitchen was gutted down to the studs, and we had temporary digs set up in the living room. Working with my two butane burners, I tried to approximate what I'd seen on TV by sauteing chunks of roughy in butter and lime juice, then serving with a lot of fixings: quartered cherry tomatoes, chopped scallions, and prepared broccoli slaw. Broccoli slaw is an awesome invention and I always have a bag of it on hand, especially in summer. And wow, were they good. I couldn't believe I'd lived this long without trying them. 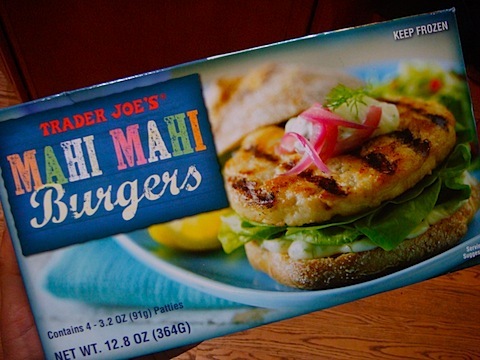 So I made these the other night but as I had no filet fish on hand, I reached instead for a box of Trader Joe's mahi-mahi burgers. These are great on the grill in summer time, they make a nice alternative to hamburgers. I figured they'd work for tacos. I just fried them up 5 minutes on a side then cut them into rough chunks. I made the broccoli slaw again although I had it in the back of my mind that the celery-fennel slaw would be amazing with fish tacos. Baby spinach, and halved cherry tomatoes and sliced cucumbers. Everyone fix 'em up, roll 'em up, come and get 'em. I can't wait to eat these outside on my deck.